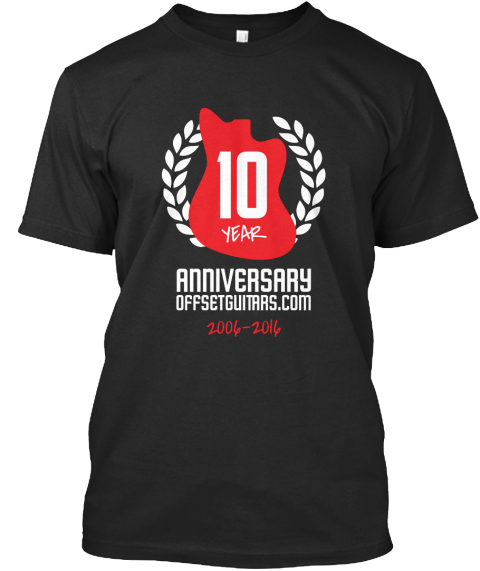 OSG 10th Anniversary Tees — Help us Cover Hosting Fees! OSG is turning 10 this month. It's hard to believe it's been that long—heck it's hard to believe we did this at all sometimes—but here we are. And with every change in the year comes a new hosting bill. We'll generally cover this stuff by ourselves, $300 isn't all that much split up amongst the modmins, but shirts have been popular so we're going to keep trying it until you all tell us to knock it off. We'll make approximately $8/shirt if we meet our 25 shirt goal. And this year we have a sweet new anniversary design done by none other than Zhivago, of "Vintage Hotties" fame. Click the shirt or link below to get started! Re: OSG 10th Anniversary Tees — Help us Cover Hosting Fees! Am I the first? Hope I am not the last. We reached our minimum! The shirts will be printed, now help us reach our goal!! Ordered, thanks for all the good times OSG. No, I am not selling the Harmony Rocket. Ordered. I love this site and the people here. Really the only happy / sane place on the Internet. Long live OSG! I did another campaign and had two folks ordering 3XL. Why can't you get that size? The basic ("premium") T goes up to 4XL. I guess if you were set on one of the others they only go to 2XL. Another shirt for another year! Ordered. yeah i'll order one later. Come on people, only 3 days left to order yours, or you'll have to wait another 10 years. mynameisjonas wrote: Come on people, only 3 days left to order yours, or you'll have to wait another 10 years.